As human beings most of us seem obsessed with success, purpose, achievement. In my mindâ€™s eye I imagine we resemble busy little ants scurrying here and there, carrying our great loads hoisted above our heads, and traveling the same repeated paths day in and day out at a frantic pace. How very busy we are reading books about finding our purpose, learning the clandestine secret to success, or maybe finding that the cheese we sought has been mysteriously stolen! Yeah, I read those books, too. Iâ€™m not proud of it, but I did read them. I read them because I thought what I was or what I had just wasnâ€™t good enough. In this be more, do more, have more society I seemed to just be . . . less. And if the best sellerâ€™s list is any indication, I donâ€™t think I was alone on that point. Which is also a very real indication as to what we value as a society, what we prize so highly we would do just about anything (no matter how inane or spiritually dangerous) to have fancy cars, corner offices, palatial homes, and designer everything. Donâ€™t misunderstand me; those things in themselves arenâ€™t bad. I personally would refuse none of them. But when that becomes our measure of what makes a life valuable; well, then it becomes a problem. It is a problem which has led us to a time and place where we have to designate a month as Respect Life Month. I first came to understand the worldâ€™s disregard for life when a well intentioned yet woefully ignorant woman, a trainee for a charity dedicated to helping seriously ill children, sat at my dining room table, pointed to my terminally ill, immobile, mentally handicapped 18-month old child and said, â€œOh, donâ€™t worry; those miracle babies are out there. I knew some people who had a genetic situation like yours and they would do an amnio and could tell if the baby was healthy. It took a few times of starting over, but they finally got their miracle baby.â€ My mouth actually dropped open. We had recently learned that our first and only child, Haley, had a terminal genetic disease. I was still crying almost continually and considered brushing my hair a real victory for the day. I just stared at the woman wondering if she had any understanding of what she had said to me. Essentially, she said that Haley had no value, that she was . . . less. Unfortunately, that disrespect for life has contributed to over 50 million abortions since 1973. Somewhere our moral compass has spun out of control leading us to believe that unborn children have no rights because they are less than those of us who support ourselves, contribute to society, and vote in elections. We wonâ€™t ever respect what we donâ€™t value. So when we value the bounty of our secular world more than the undeserved gift of life given to each of us through the grace of God, we build a society that says some people get to be miracles and some people get to be dispensable. Haley lived to be three and a half, dying on January 19, 2004. For 42 months we lived in the palm of Godâ€™s hand. He drew us close, met each need with the perfect answer, and revealed his presence in ways which I believe to be truly miraculous and undeniable proof that He is very real. Her life has left an indelible mark on the faith life of many people — those who knew her and those who merely heard her witness. I continue to be amazed at the number of people who to this day relate to me how her story has changed their own relationship with God. In my own heart, I know that Haley shares a part in my own salvation through Christ. She led me to Him which is a gift beyond measure. A bedridden child managed to lead me and many others to Christ — now that is the best kind of miracle baby. That is how God defines purpose and measures success. 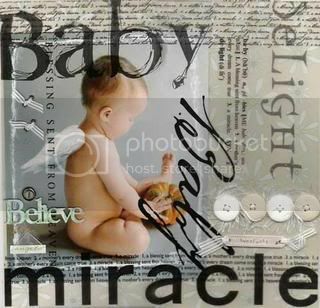 Every life, every baby, is a miracle. Kasey Eoriatti and husband Alan live in the greater Des Moines, Iowa area with their three children and are parishioners at St. Francis of Assisi Catholic Church in West Des Moines. Kasey also teaches first grade at Holy Trinity Catholic School in Des Moines. Kasey-I love Haley’s story more every time I hear it. You were an amazing mama to her. Thank you for sharing her story and allowing others to grow deeper in their faith thru your example. May God contnue to bless you and your family. Kasey, thank you for sharing with us the power of God’s love shown through your angel in heaven. What a gift that has now given you such a perspective that few others have in life. When we don’t value life, nothing else really matters. Thank you for that blessed reminder! My daughter has Down syndrome, and when we received the diagnosis, I thought my world was ending. And yet she has changed my world, and many other people’s, for the better. I can’t imagine the pain of losing a child, much less the pain of being told that child’s life never had any value in the first place.